When I asked P a few weeks ago for recommendations on where to eat in the city, he threw out Dmitri’s and Effie’s, two greek restaurants. 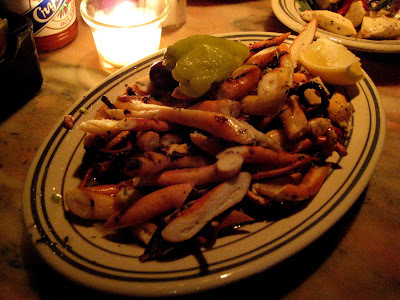 On the drive over to Franklin Fountain the other night, we passed Dmitri’s, and I said to myself, oh, that’s where Dmitri’s is. The next night when I was forced to pick a place for dinner (oh, the bane of being a food blogger), I thought why not. There are two Dmitri’s, and this one on 3rd is a BYOB. The place is pretty teeny tiny, and when we got there at about 8:30, it was packed. We had to wait about a half hour, so we walked around a bit. Whenever we got back from the walk, we were seated immediately. Table space is very limited, it’s pretty much packed to the gills. The waitresses are all surly and tattooed and clad in black tank tops. A bit like the cheerleaders from the “Smells Like Teen Spirit” video. Like they would cut you if you wronged them. 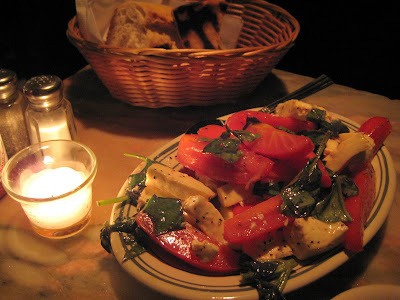 One of the specials of the nigiht was the tomato basil and mozzarella salad. I was expecting one giant tomato and a big slice of cheese on top. Instead, we got this sizeable plate packed with some of the tastiest tomatoes ever. Man, was this good. Everything about it was good. Oh, and you get free bread and pita too. Good and good. The pita bread was a little bit charred, but lucky for me, I like burnt stuff. P said the octopus was good so I had to try it. Again, a sizeable dished packed with grilled octopus. These are pretty no frills, just simply grilled served with some oily dressing on the bottom of the plate. I thought it was good, but I wasn’t crazy about it. J wasn’t crazy about it either, but that didn’t keep him from stuffing himself with it. It was even garnished with some olives and pepperoncinis. J liked the olives (I hate olives) and I liked the pepperoncinis too. 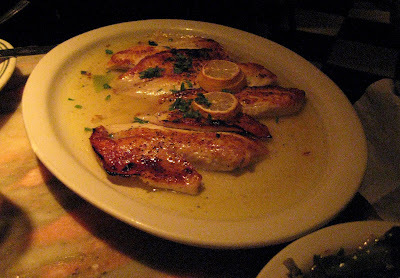 One of the fish specials of the night was the tilapia. That’s a whole lotta fish if you ask me. That plate is not small. Those pieces of fish are not small. This was a hearty portion of fish. It was simply prepared, grilled, and came with some kind of white wine based sauce. Simple, yet good. J was practically drinking this sauce, or at least sopping it up with bread. I went with the scallop platter. You can get this grilled or fried and I went with the grilled. Again, very simply prepared, just grilled. I thought I would get like 3-4 big scallops. Whoa, was I wrong. 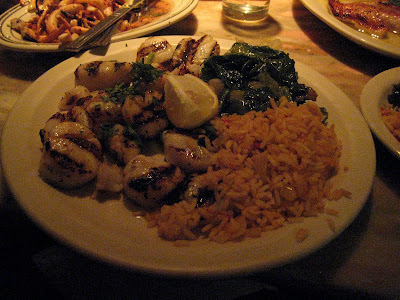 There were at least a good dozen scallops there, way too much food for me. These were delicious. Grilled perfectly, so that it wasn’t overly done at all. Both the entrees came with rice and escarole. The rice was just fine, but this escarole crap was really unappetizing. I expected any kind of taste but what I got. Bland and bitter. Blech. I left the giant lump of this escarole pretty much untouched. In fact, when we had the leftovers boxed up, J insisted that I did not want the greens wrapped. There was tons of food left… tilapia, scallops, and octopus. We should have just gotten a couple more appetizers, nixed the entrees, and called it a day, but we didn’t know we would get so stuffed. Really, I need to stop this gorging. We ended up using the scallops and octopus the next day as ingredients for improvised lobster ravioli from trader joe’s. You know what? It actually tasted even better the next day. Thanks for the recommendation P. I can see why this place is packed.